Then the variable L[rotation] would return the coordinates of L in whatever rotation it happened to be in (in this case [0,1], [1,1], [2,1],[3,1]). Rotating blocks is very quick this way, but the downside is that rotational info has to be manually inputted for each block. Since the block game I’m making isn’t just a tetris clone, and I want to have a shop in in where players can buy or maybe even design their own blocks, I’ve decided not to use this method. 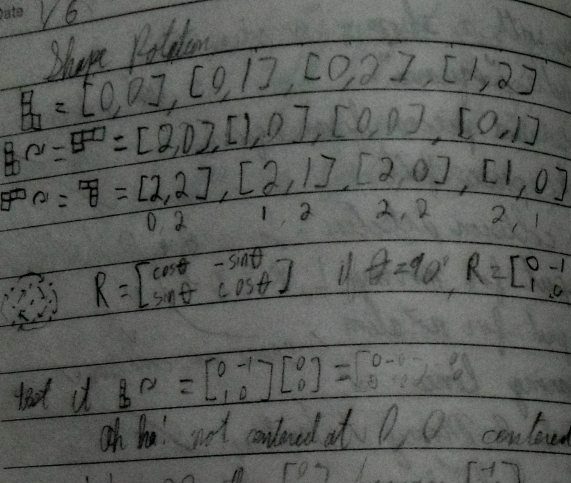 Instead of entering everything in by hand, I’ll use math and let the computer do the work of coming up with the transformations for each block. 2D rotations are a simple 2×2 matrix multiplication, and 90 degree rotations are even easier than that. This way, each time a piece is rotated, the locations of its constituent tiles will be updated by a matrix multiplications. 1) Matrix multiplication is very slow compared to an array lookup. I can live with this. It’s not 1985 and there will only be one block being rotated at a time anyway. 3) Some pieces should just stay in place when they rotate. A 2×2 square is a perfect example. Yes, I could just have it rotate around whichever of its four tiles happened to be at location 2,2. It would look stupid, though. The center of the visible part of the piece isn’t on any of its constituent tiles, it’s between them. I solved this problem by allowing a property to the block class to state that rotations should do nothing. I’m not 100% satisfied with this, but off the top of my head I can’t think of any pieces that must transform when rotating and yet would look bad rotating around one of their constituent tiles. I ran into some problems with handling the block sprites. I was basically just using the same built-in .x and .y properties built into flash sprites and adding some number to currentBlock.y in the event loop for gravity, and either adding or subtracting from currentBlock.x when a direction arrow was pressed. The problem with this was that it made collision detection a pain, and it also raised questions like what to do with a block partway between two square locations. In a game like Tetris or Blockout, the squares of the playing pieces have to fit into the squares on the board. static const size:int = Board.gridSize; //size of the board’s "squares"
With the convenience of these getters and setters, along with a few others for width and height of pieces in terms of grid squares, it made animation very easy. I didn’t need to refer to x,y screen coordinates again in the block class and could just increment or decrement currentBlock.gx or currentBlock.gy by one to move a block one square. Collision detection was similarly simplified. Instead of needing to use hitTestObject() as I did in the other two games I’ve made, all that was necessary was 2 dimensional array of the playing grid, filled with zeros for empty locations and ones for locations with a block. Then, before moving a piece, I just check to see which grid locations the piece would occupy and not allow the move if they’re occupied. For example, If I had a long thin piece occupying squares (5,4), (5,5), (5,6), and (5,7) then all I’d have to do is check (6,4), (6,5), (6,6) and (6,7). If all of them are unoccupied then I can increment currentBlock.gy and move the piece. Moving left, I’d check (4,4), (4,5), (4,6) and (4,7). 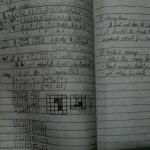 In retrospect it seems obvious that a grid representation would be the way to go for a game with pieces and a playing field broken up into discrete squares (or cubes for blockout), but it wasn’t the first idea I had.